Recently, one of my clients launched a new site for a program he just recently launched. He was really proud of it and rightly so; it looks beautiful. So he showed it off to a colleague. One of the first things the colleague noticed is that Google Analytics was not installed on the website. This is a great reminder of one of the fundamental lessons for small business owners setting up new sites: your developer does not do SEO and will not set up any tools unless you ask them. Yes, yes you do. Unless you either a) don’t want to know what traffic is coming to your website or b) have an alternative program that you know and like (and then you wouldn’t be reading this post…), then you need Google Analytics. It is a requirement, one of the fundamental requirements of having a website. If you’re not comfortable setting up, your developer should have zero problems setting it up for you. But you must ask your developer to do this. I have launched many websites and in every single case the developer did not set up Analytics until asked, or I did it myself. More than once I have gotten angry with a developer for not setting up Analytics but later realized that I had never asked him to do so. Once again: Don’t assume your developer will set up your Analytics account. 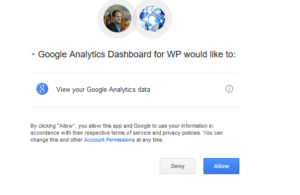 If you’re using wordpress, as most of you are, setting up Analytics is quite simple. If you are using a different CMS, such as Joomla or Drupal, the process is different but not that much more complicated. If you are not using a CMS, then it will require a developer. In the search field type in “Google Analytics Dashboard for WP” or some combination of those words. You do not have to pick this plugin; it’s just my preferred plugin for Analytics. But it’s worth looking at both the installs (800,000 in this case) and the star rating before picking the one that’s right for you. Click “Install” and then “Activate.” If you can’t activate it from the same screen as you installed it, you will have to go back to “Installed Plugins” to Activate it. 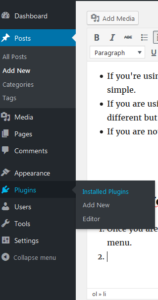 How you do this will depend upon which version of WordPress you are using. Go to analytics.google.com. If you don’t already have an Analytics account, you will have to create one, either with a gmail address or with the email address associated with your business and your website. Once in the Dashboard, click on “Admin” and then click on “Create New Account” on the left panel of the Admin page. Complete the steps to name your account and property. Don’t forget to pick the correct time zone. Paste the code into the appropriate field in the other tab, which should still be open, and save the code. Double check that the UA number is the same in your plugin and your analytics account! Save changes and you’re now tracking your website visits! Congratulations, you now have Google Analytics set up on your wordpress site.